New here? Wondering what an industrial farm, or a CAFO is? Check out our Introductory post. 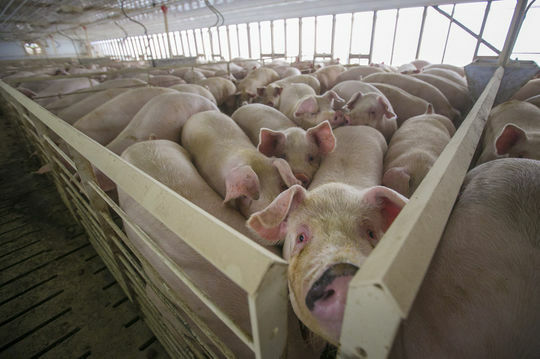 On April 4, the first in a series of groundbreaking lawsuits against the country’s largest pork producer, Murphy-Brown LLC, began in federal court in Raleigh. More than 500 plaintiffs, mostly low-income minority citizens, living near the hog facilities have complained for years about the industry’s practice of storing waste in open cesspools and then spraying the liquefied urine and feces into the air near their properties. This practice, along with the practice of storing dead hogs in boxes around the facilities, attracting swarms of flies, buzzards and gnats, has damaged their quality-of-life, caused health concerns and diminished their property values. An important point to remember is that the defendant in this case is the billion-dollar corporation, not the contracted farmers managing the facilities. The complaints will be broken up by area; the first trial concerns ten plaintiffs near Kinlaw Farm in Bladen County. Lawyers for Murphy-Brown, LLC said in court filing that jurors should not hear about alternative methods for waste management used outside of North Carolina; jurors will also not be informed about the Chinese buyout or Murphy-Brown’s lobbying activities, which led to recent NC legislation limiting the amount of money people suing agricultural companies can collect in nuisance cases like this (a subsequent amendment deemed this law not retroactive to cases already filed, including this case). Click the image below to watch this short, but powerful video, just released, which includes comments from Cape Fear Riverkeeper Kemp Burdette, and provides a disturbing look into how the corporation’s antiquated waste management system affects the lives of your North Carolina neighbors and visit our Take Action page to find out what you can do to put pressure on this industry.